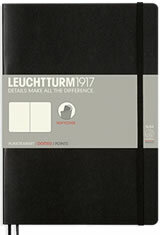 The Leuchtturm1917 A5 Softcover notebook is 5.7in x 8.26in(145mm x 210mm) and has a flexible cover. The notebooks have 121 numbered pages and both have a blank table of contents. The notebook also has 8 perforated and detachable sheets as well as an expandable pocket and page marker. The thread bound notebook opens flat and has an elastic band closure. The interior pages are ideal for fountain pens, ink proof and acid free. The Leuchtturm1917 A5 Softcover Memo & Notebooks usually ships within 1 business day unless otherwise specified. Each Leuchtturm1917 A5 Softcover Memo & Notebooks we sell is guaranteed to be genuine, authentic and will arrive brand new & unused! I can't say too much about this item because this is the third or fourth one I've bought so I knew about it long before buying it. Obviously I like it and I'm very happy with it again.